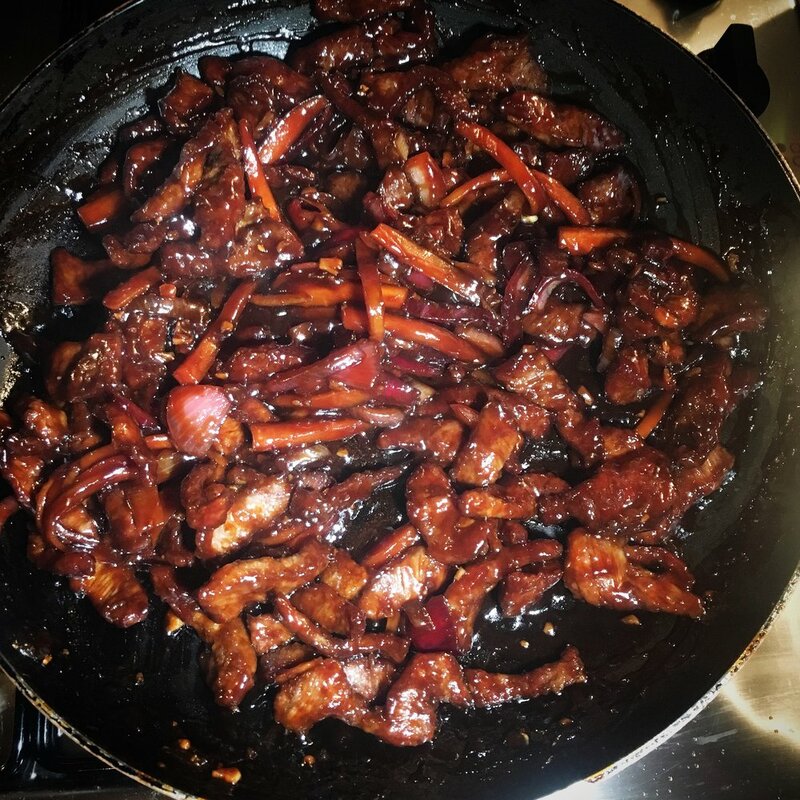 Crispy Beef is one of my all time favourite Chinese dishes, tender crispy pieces of steak coated in a sweet and zingy sauce creates a wonderfully vibrant dish worthy of any Chinese banquet. For the beef I used flat iron steak but any tender cut of beef will do. You can tweak the recipe as you wish by making it sweeter (by adding more honey), hotter (by adding more chilli sauce) or more sour (by adding more vinegar). Finely chop the carrot, ginger and garlic and fry on low heat for 5 minutes until the carrot is soft. Prepare the beef by cutting the steak into thin strips. Place in a bowl along with the cornflour/salt and mix well. Pour the Vegetable Oil into a deep frying pan and heat. Test the temperature by dipping a piece of beef into the oil, if it starts to sizzle your good to go, remember to cook the beef in batches so the oil temperature doesn't drop. As the beef is thinly sliced it should only take 2 minutes to cook. 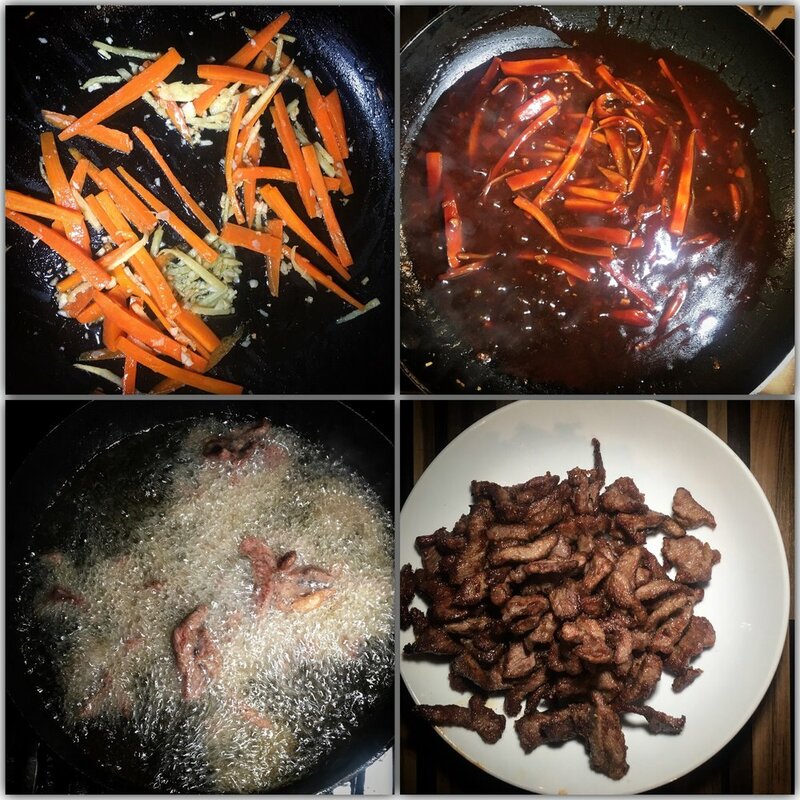 While the beef is resting finish the sauce by adding the chopped onion along with the chilli sauce, the juice of two mandarin oranges, soy sauce, honey and vinegar. Mix well and simmer for 3 minutes. The last step is to add the cooked beef to the pan along with the sauce and combine. Serve with boiled/fried rice or soft egg noodles and garnish with sesame seeds and fresh chilli.